Need a dinner idea to take to a sick friend? It always seems to bring up all sorts of uncertainty on what to bring that will please their family and not seem too strange. (No one wants to be the one bringing the strange casserole!) This bake and take dinner idea may be the perfect one to keep on file. At almost the last minute I got asked at Church if I could take dinner to a family who's wife/mom is recovering from surgery. I turned to an idea I use frequently for just this purpose. It's simple yet yummy and perfect for taking dinner to others. You can take it over un-cooked, for them to cook also, but potatoes don't freeze well, so this dish is best done at the last minute, which is good since it is super fast to throw together! Bonus Idea: At the end of the post I'll also show you how I used the same idea along with using up this and that from my fridge and made a similar dinner for my own family on the same night. 4-5 red skinned potatoes, cut into quarters. 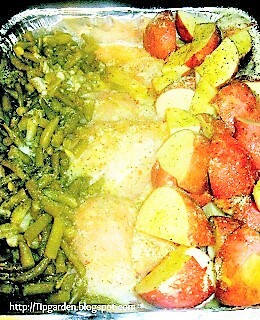 In a disposable 9 x 13 roasting pan, layer 4-6 boneless skinless chicken breasts down the middle of the pan. 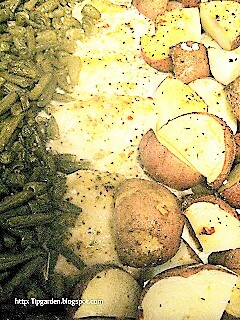 Layer the drained green beans along one side of the chicken breasts. Layer quartered potatoes down the other side of the chicken breasts. Drizzle melted stick of butter over the entire pan of food. Sprinkle the dry Italian Dressing herbs over the entire pan of food. Bake at 350 degree's for 45-min-1 hour till potatoes are tender and chicken is cooked through. During last 30 minutes I popped a Pillsbury french bread loaf on a cookie sheet on the upper rack and baked it at the same time and took them a warm loaf of bread with the dinner.